Russia has announced it would continue implementing the truce agreement for Syria's Eastern Ghouta, urging the West to assist in ensuring the ceasefire conditions, despite the fact that the humanitarian pause in besieged area, which came into effect in the early hours of Tuesday, was broken by militants in violation of the UNSC's resolution. On Saturday, the UNSC unanimously adopted Resolution 2401 that urges all parties to the conflict to immediately stop all hostilities and adhere to a long-term humanitarian pause across Syria in order to ensure the safe and unhindered delivery of humanitarian aid, as well as medical evacuation of those injured. Russian Defense Minister Sergei Shoigu said on Monday that per President Vladimir Putin's order, a new daily humanitarian pause in Eastern Ghouta would start on Tuesday from 9:00 a.m. to 2:00 p.m. local time (07:00-12:00 GMT). 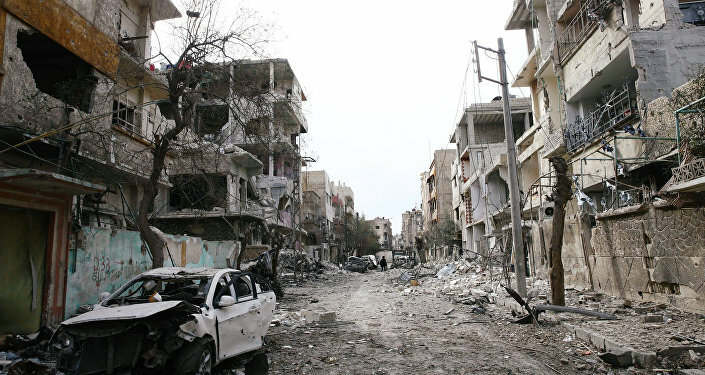 Eastern Ghouta remains one of the last terrorist strongholds in Syria controlled by the Jaysh al-Islam and Ahrar al-Sham groups and the Jabhat al-Nusra terrorist organization (banned in Russia) that regularly carry out massive mortar attacks on Damascus' suburbs and city center, where the Russian Embassy’s building is located. A de-escalation zone was created in Eastern Ghouta this summer, but the situation on the ground has drastically worsened in recent weeks. The humanitarian pause came into effect on Tuesday without delay. Syrian authorities together with the Russian center for Syrian reconciliation created the conditions for opening the humanitarian corridor between Damascus and its suburban area for civilians in the Wafedeen refugee camp. A mobile first-aid post was established near the corridor, and buses were prepared to transport civilians to the places of temporary stay. The reconciliation center ensured the safety of all civilians, including the sick and wounded, who were ready to leave Eastern Ghouta. However, only an hour and a half into the pause it became clear that terrorists in Eastern Ghouta were not going to comply with the truce conditions. 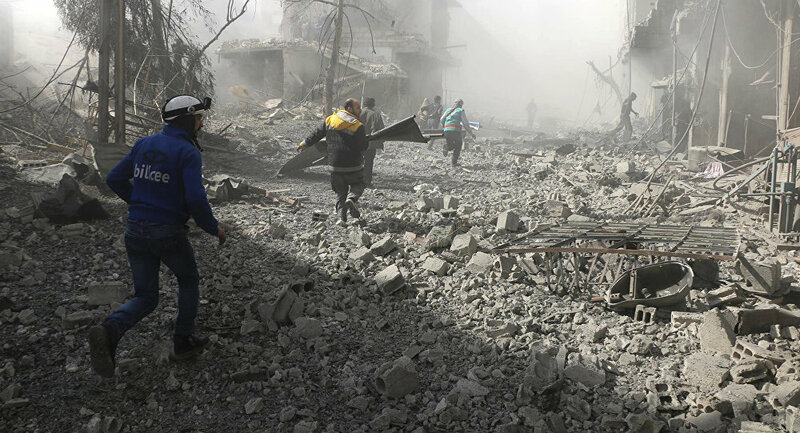 According Gen. Viktor Pankov, the head of the Russia's monitoring group at the Eastern Ghouta de-escalation zone, powerful mortar attacks targeting the humanitarian corridor did not allow civilians to leave the area, whereas Syrian troops ceased fire at 9 a.m. as planned. "Illegal military groups operating in Eastern Ghouta, such as Jaysh al-Islam, Ahrar al-Sham, Jabhat al-Nusra and the al-Rahman Legion prevent civilians, even elder people, women and children, from leaving the combat area and hold them hostage," Maj. Gen. Vladimir Zolotukhin, the spokesman for the Russian center for Syrian reconciliation, said. According to the SANA news agency, citing a source in the city police, at least six civilians were injured in the shelling after the pause came into effect. Terrorists continued their provocations every 30 minutes during the entire pause. When the five-hour period was over, the reconciliation center said that nobody was able to leave Eastern Ghouta, and the situation remained critical. Following the developments in Eastern Ghouta, Russian Foreign Minister Sergey Lavrov said the situation is Syria was nowhere near a truce. 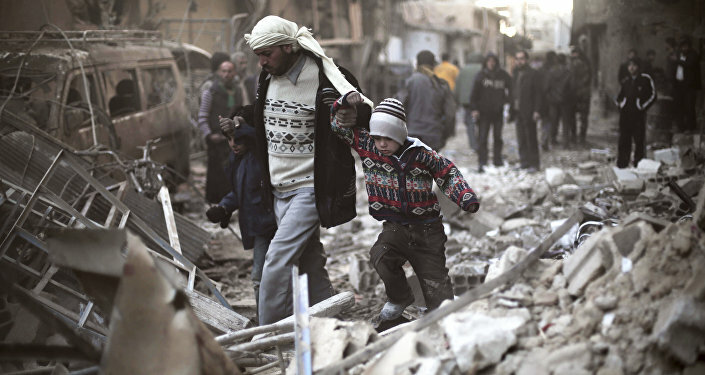 "Speaking about the humanitarian situation in the various parts of Syria … the situation is not that good. You know our position on Eastern Ghouta, we have supported the resolution to cease hostilities in Syria, which engaged all parties and covered the entire Syrian territory … Obviously, we are still very far from it," Lavrov said during a joint news conference with French Foreign Minister Jean-Yves Le Drian. Lavrov stressed that Resolution 2401 demanded all parties that besieged Eastern Ghouta and Shiite enclaves such as Foua and Kefraya, to lift the blockade, provide access to humanitarian aid and medicine, and allow civilians to leave. He also commented on the statement that three militant groups asked the UN to support a truce in Syria. "We will see how real the statement of three illegal military groups that differ themselves from Jabhat al-Nusra in Eastern Ghouta, concerning their readiness to implement Resolution 2401," Lavrov said. According to Kremlin spokesman Dmitry Peskov, the timing of the humanitarian pause in Eastern Ghouta will depend on the terrorist groups’ behavior. "It depends on how terrorist groups will behave, whether they resume shelling and continue with provocations," Peskov said, asked about a possible extension of the humanitarian pause. Peskov also noted that while Russia would continue to work to implement the UNSC resolution for Eastern Ghouta, the Kremlin still regretted that Russia’s partners ignore the terrorists’ atrocities there. Asked whether the Kremlin suspected that its partners would attempt to blame Moscow for the conflict in Eastern Ghouta and how Russian authorities would react to this scenario, Peskov reiterated that Russia would proceed with implementing the UNSC resolution "while advocating its position."